FILE - Lightning strikes over Lake Mead near Hoover Dam at the Lake Mead National Recreation Area in Arizona, July 28, 2014. For Arizona and Nevada, the reservoir on the Colorado River is a major source of drinking water. 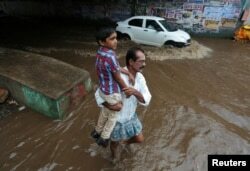 A man carries a child as he wades through a waterlogged subway after heavy rains in Chennai, India, Aug. 9, 2017. “We are seeing critical shifts in leadership from cities and companies in response to the very real threat of flooding, for example, to local economies,” said Morgan Gillespy, head of CDP's Water Program. Tropical Storm Harvey, pounding the U.S. Gulf Coast, has killed at least eight people, led to mass evacuations and paralyzed Houston, the fourth most-populous U.S. city. The storm is most likely linked to climate change, said the U.N. weather agency. The United Nations predicts a 40 percent shortfall in global water supply by 2030, while global demand is set to increase by 55 percent due to growing domestic use, manufacturing and electricity generation.